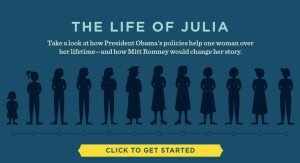 Last week, in an advertorial slideshow on ObamaForAmerica.com, the president’s re-election campaign introduced “The Life of Julia” about a fictional “everywoman” whose government-subsidized existence is intended to reassure women voters about President Obama’s ability to provide for them in an uncertain future. This “composite” female — not to be confused with the one who portrayed Mr. Obama’s “girlfriend” in his autobiography — supposedly reflects the concerns of girls and women through the life cycle. Julia’s carefree life begins at age 3, when she heads off to the federally subsidized Head Start program. Next thing you know, Julia breezes through high school (thanks to the president’s “Race to the Top” education funding) and on to college, where she has access to student loans (Debt! Goody!) and free health care thanks to — that’s right — Mr. Obama. Moving seamlessly through adulthood, Julia takes advantage of more free health care to bear a child (apparently without a husband or partner), as well as a Small Business Administration loan, Social Security benefits and Medicare coverage. Julia’s mailbox literally is overflowing with government checks, all of which are available to her thanks to Mr. Obama, whose re-election would help us avoid the many scary alternatives that could take place should Republicans take control. Conservative commentators point out that “The Life of Julia” is creepy and condescending. Graphic Julia has no facial features, all the better to be led blindly down the path to socialism. Insultingly, she achieves nothing on her own, nor is there any mention of her personal support network (you know, a husband or family). Rather, her feminist triumphs all are achieved with the help and support of the ultragenerous Mr. Obama. More telling about the “Julia” meme is not only what it conveys about the president’s vision of women’s needs and priorities, but also his underlying belief about his personal role in the lives of American citizens. He’s Julia’s government sugar daddy, here to ensure she can reach her cute little dreams and live happily ever after. Similarly, in September 2009, Mr. Obama famously opened the school year with a speech to America’s schoolchildren in which he outlined the ways in which he, personally, was seeing to the education of the nation’s students. On the surface, the president’s school-day speech read like a parental lecture. (Or maybe one from a well-meaning but boring uncle.) But beneath the pep-rally rhetoric, Mr. Obama wove himself seamlessly into the lives of America’s children. “Now, your families, your teachers and I are doing everything we can to make sure you have the education you need. … I’m working hard to fix up your classrooms and get you the books and the equipment and the computers you need to learn,” he said. The speech would only have been misleading if he had stopped there. But the president went even further, playing the role of uber-father and benevolent disciplinarian by stating his expectations for the school performance and behavior of America’s students. Problem: The president of the United States has no business setting such expectations. Unless we’re a socialist country, that is, in which case the government reserves for itself the proper education and formation of its children. In that case, not only will Julia’s education be launched at Head Start, but she’ll also be tracked for her likely academic success and her choices will be limited to those established by the state. The essence of that school-day speech, like the “Julia” theme, struck a disturbing chord with those of us whose ears perk up at the sound of our liberty fading into oblivion. In a free society, the government’s role is to serve and protect its citizens while we, the people, exploit our freedom and make the most of our own lives. The president’s vision of Julia’s life reflects a puny and offensive view of American women. It’s all reassurances of so-called “reproductive health” — because surely all women think with their uterus — and after that, it’s a pat on the head and a government check and congratulations on a great life. It’s no wonder Julia can’t smile. I don’t want the Government in the classroom. They can’t operate Congress what makes them think they can manage a classroom? Why do people of today want the government to do things for them? The “Julia” characterized here is scary, very scary. Please tell me that no one viewed this malarkey as a good thing. Once again our wonderful collection of elected placeholders in Washington make retirement in a foreign country look good. And to think I donated 20 years of my life defending them. And my youngest son does so now. Tarheel, I thank you for your 20 years of service to our country. I also wish to thank your son for serving the people of our country. Obama is the composite of everything wrong in this country. He is the problem, not the solution.